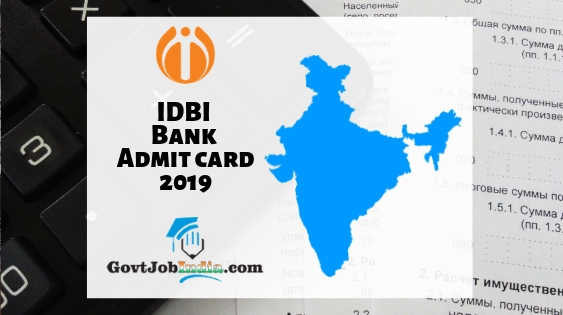 IDBI Bank AM Admit Card 2019 Download– The Industrial Development Bank of India will release the IDBI Bank Assistant Manager Hall Ticket 2019 as soon as the applications process is over. Candidates will be able to download the IDBI AM Call Letter in the coming few days. We have also given the IDBI Assistant Manager Admit Card Release Date and other documents which you will need to carry to the examination hall. Basically, we can give you an in-depth idea of how and when to appear for the IDBI Bank Assistant Manager Exam. Furthermore, in this article, we have also given details related to the IDBI Bank Assistant Manager Exam Dates and Exam Centers as mentioned in the official notification PDF. Applicants are advised to skim through the entire article and keep the pointers in mind. Additionally, we have taken all this information about the IDBI Bank Assistant Manager Admit Card 2019 from the official website @ idbi.com. All of you interested are urged to go to this website once at least. The IDBI Bank Assistant Manager Recruitment is an amazing opportunity and please don’t let this chance pass you by. You can ensure that you get this job opening by preparing the IDBI Bank Assistant Manager Syllabus well before your examination. But before you head over to that page, make sure to go through the IDBI Bank Assistant Manager Admit Card details for the year 2019. View detailed IDBI Bank Assistant Manager Syllabus and Exam Pattern 2019. How to download the IDBI Assistant Manager Hall Ticket 2019? Go to the official portal of the Industrial Development Bank of India which is www.idbi.com. On the official website, you will find the “career” section. On that section, click on the segment where you will find IDBI Assistant Manager Details. There you will find the IDBI AM Hall Ticket as a newsflash. Please note that this will be there only when the admit card releases. Next, please enter your registration details (Date of Birth and registration number) on the page which comes up. Submit the information and your IDBI AM Admit Card will be on the screen. Download it using (CTRL+D) and further take a printout of it. Thus in 5 easy steps, you would get the examination call letter to yourself. The Industrial Development Bank of India has come out with a tentative date as to when the written exam will be conducted. The exam date declared by the IDBI Bank is 17th May 2019. All the details pertaining to the exam dates and the exam centres have been included in the section below. The exam centres for the recruitment exam are Ahmedabad, Amritsar, Bhopal, Bengaluru, Belgaum, Bhubaneswar, Coimbatore, Chennai, Chandigarh, Delhi – NCR, Guwahati, Gwalior, Hyderabad, Jaipur, Kanpur, Kolkata, Kochi, Lucknow, Madurai, Mangalore, Mumbai / Navi Mumbai / Greater Mumbai / Thane, Nagpur, Patna, Pune, Raipur, Rajkot, Ranchi, Thiruvananthapuram, Vijayawada and Vishakhapatnam. IDBI Assistant Manager Hall ticket. Since this page has been made before the IDBI Written exam, we have focused mainly on this. But to give you some idea about the interview and the call letter, we have dedicated this section for it. Candidates are to note that there will be a separate call letter issued to all those contenders who get selected for the next round of the recruitment, i.e., interview. We will be updating our page as soon as information about the IDBI AM Interview 2019 comes out. You are advised to stay tuned to this page as we will be updating all the details about the IDBI bank AM Interview Call Letter as soon as anything comes out. Did you find this article about the IDBI Bank Assistant Manager Call Letter 2019 informative? How were the presentation and the general look of this article? If you liked it, then share this piece with all those who might be looking for this information. You may be helping someone out by doing so. Additionally, comment below in case you have any uncertainties about the IDBI Bank Assistant Manager Admit Card. We will get back to you as soon as possible. Summing up, our team would urge you to subscribe to our website @ GovtJobIndia.com for latest updates about the newest vacancies across the nation.